Haida Nation President Guujaaw for reviewing prior to publication. Haida Gwaii, once known as the Queen Charlotte Islands, is a chain of two large islands and hundreds of smaller ones. The islands’ lush, humid forests contain spruce, hemlock and cedar trees. The western red cedar is what is known as a “cultural keystone species” for the Haida: it feeds their way of life materially, socially and spiritually. The Haida use cedar for canoes, longhouses, hunting and cooking instruments, clothing, totem poles, mortuary poles, masks, rattles and other ceremonial items; examples of this unique material culture are now exhibited around the world. The old-growth cedar forests also sustain medicinal plants and other species important to the Haida. British Captain George Dixon, the first European to set foot in Haida territory, named the islands after his ship the Queen Charlotte in 1787. A smallpox epidemic in 1850 killed 90 percent of the Haida population, leaving only 277 native residents on the islands. As the British moved into remote areas of British Columbia throughout the late 19th century, the Haida managed to fend off occupation, but the natural resources their islands offered were too much to be ignored. Logging exploded in the 1940s due to the demand for supplies to support World War II. Over the last 100 years, the Haida have seen such severe clear-cutting of the red cedar trees on Haida Gwaii that they fear their lands may never recover. In addition to the importance the Haida place on the cedar trees themselves, logging has caused extensive damage to both terrestrial and riverine ecosystems, which support flora and fauna unique to the islands. The islands’ distinct species and subspecies of birds, mammals, fish, insects, and plants likely evolved due to their isolation from the mainland and the fact that they avoided the glaciation of the last ice age. Haida Gwaii was opened up to corporate access without any treaties that ceded legal authority to the British Columbia government. Between logging and the loss of commercial fishing licenses to large companies, the Haida have found it increasingly difficult to make a living off of their own land. The Gowgaia Institute, a local environmental group, estimates that 103 million cubic meters have been logged over the past century with an estimated raw log value of 15 billion Canadian dollars. If that wood were turned into telephone poles and lined up end to end it would circle the earth 24 times. Decades of destructive forestry culminated in the first widely publicized protest against logging in Haida Gwaii in the winter of 1985-86. Police arrested 72 Haida for blocking logging trucks near the village of Hlk’yah on Lyell Island. Meanwhile, the Council of the Haida Nation designated the contested islands of Gwaii Haanas (South Moresby), the narrow southern stretch of the Haida Gwaii archipelago, a “Haida Heritage Site.” These protests laid the groundwork for the future national park and for legal challenges to corporate logging. The alliances formed at Haida Gwaii between First Nations and environmentalists during the 1980s helped to change the way environmental activism was conducted in Canada. SGang Gwaay, the best-known island in the southern archipelago, was designated a UNESCO World Heritage Site in 1981. In 1993, the Haida and the Canadian government signed an agreement creating the Gwaii Haanas National Park Reserve on the group of 138 islands that make up Gwaii Haanas. The name means “place of wonder,” an apt description of the dramatic terrain of mountains, caves, waterfalls and beaches. While the Haida obtained a comanagement agreement for Gwaii Haanas that spared these islands from further logging, the operations of Weyerhaeuser, Western Forest Products and other timber companies continued on the rest of the islands of Haida Gwaii. The Haida filed a rights and title lawsuit in 2002 with the British Columbia Supreme Court to settle the larger question of aboriginal title to all of Haida Gwaii and later to prevent the government from awarding more timber licenses to Weyerhauser while the title question was still unresolved. On Nov. 18, 2004, the Canadian Supreme Court ruled on the case of Minister of Forests and Attorney General of British Columbia v. Council of the Haida Nation. As long as the title claim was unsettled, the court declared, the government must consult with First Nations regarding development on Haida land. Unfortunately, the court’s ruling did not give specific requirements for consultation, and the British Columbia government continues to authorize timber harvesting at a level that the Haida consider unsustainable. In the face of legal fights that dragged on, the Haida again took to direct action to protect their forests. In April 2005, Weyerhaeuser announced it was selling its license holdings on Haida Gwaii to the Brascan Corp., and the Haida feared a massive logging spree before the sale. The Haida and other local nonindigenous people arranged their boats throughout island harbors to prevent Weyerhaeuser barges from coming through. Protestors seized log booms containing CA$5 to 10 million worth of timber and stalled logging for four weeks. They dubbed their action “Islands Spirit Rising.” The blockade ended with a draft agreement between the government and the Haida that excluded large areas of Haida Gwaii from timber harvesting licenses until Dec. 31, 2008. Aside from their primary concern over logging, the Haida also want to see regulation of commercial fishing and an end to recreational bear hunting. Haida Gwaii is home to the Queen Charlotte black bear, a subspecies thought to be the largest black bear in the world. Slowly, the British Columbia government seems to be recognizing the Haida’s right to manage their ancestral land and the irreversible damage that will be caused by loosely regulated logging in old-growth forests. In April 2007, the federal and provincial governments announced the transfer of CA$25.46 million in compensation for logging to the Gwaii Forest Charitable Trust for use on forest and community sustainability projects. 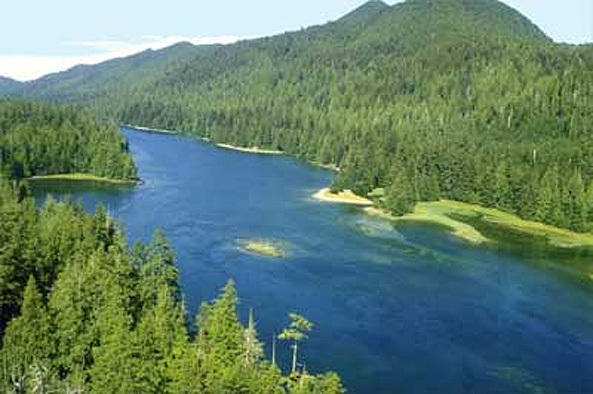 On Dec. 12, 2007, the Haida Nation signed an historic agreement with the government of British Columbia to comanage 52 percent of Haida Gwaii. The significance of this Strategic Land Use Agreement is that it acknowledges the Haida Nation as a governing body, not just an interest group, and it emphasizes sustainable economic development for the community. The agreement calls for the designation of “Haida Natural, Cultural and Spiritual Areas” to represent traditional land-use principles and place them on an equal footing with conventional governmental designations, such as protected areas and areas where forestry is permitted. The Strategic Land Use Agreement is best seen as the beginning of a new relationship between the Haida Nation, the provincial government and industry. One specific set of negotiations revolved around the conditions under which the Brascan Corporation can harvest timber, the sharing of revenue from such a venture, and securing a permanent role for Haida officials in future negotiations. A tentative agreement signed on May 11, 2005 designated which areas of Haida Gwaii will be available to Brascan, and states that in total all the companies operating on Haida Gwaii may harvest a maximum of 900,000 cubic meters of wood per year, an improvement from the 1.1 million cubic meters Weyerhauser alone was allowed previously. The Haida themselves will be permitted to log up to 120,000 cubic meters of timber annually. Further, the British Columbia government will pay the Haida CA$5 million in resource revenue to be followed by a revenue-sharing agreement. Meanwhile, the Gwaii Haanas Haida Heritage Site and National Park Reserve continues to be a promising example of comanagement between public parks and indigenous people. In 2005, it was designated the top park destination in North America by the National Geographic Society. This is due in part to the strict limits on visitor numbers and activities; only 300 people may enter Gwaii Haanas at a time, a restriction that resulted in a total of 2,100 visitors in all of 2004. The park is only accessible by boat, float plane or kayak, and its lack of roads and camping facilities further limit visitors. Canadian parks also have an advantage over American parks because of their differing federal mandates: Parks Canada holds environmental preservation as its top priority, while the U.S. National Park Service is required by law to balance preservation with outdoor recreation activities. Most importantly, the Haida make up 50 percent of the park’s management board and staff. They have played a key role in the planning and construction of the Qay’llnagaay Heritage Centre, a facility that is part museum, visitor center and performance hall. Haida watchmen live at sites around the island from May to September, protecting the sites and interpreting their natural and cultural significance for visitors. An example of how park management changes when indigenous people are given authority can be seen in the treatment of the numerous longhouses, house pits and collapsed poles that remain on SGang Gwaay. Rather than fighting to preserve these outdoor structures with the latest technology, the Haida have chosen to let them age naturally, caring for the structures in a traditional manner and accepting their inevitable decomposition. The Haida, like many indigenous people, seek to harvest the earth’s resources in a sustainable way, so future generations can continue to live off the land. The Council of the Haida Nation has drawn up the Haida Land Use Vision, which outlines the foundational principles of land use agreed to by consensus. The document includes a plan for cedar growth over the next 1,000 years. A possible new aid to the Haida’s cause is the practice of carbon trading, whereby pollution-generating corporations are required to make up for their emission of carbon dioxide by paying for mitigating activities elsewhere. In the case of the Haida, this would mean that the nation would be paid to replant conifer trees on their islands, repopulating the forests with a mix of appropriate tree species, not just the fast-growing alders that were previously planted as a quick solution to deforestation. The operation would not only help restore the ecosystem, but also provide jobs to local residents. Not coincidentally, Shell Canada, whose offshore oil drilling the Haida have protested, has put itself forward as the first participant. The carbon-trading proposal prepared by the Masset band of Haida could result in 35 to 100 jobs, significant for a community of 750 residents in which 70 percent of working-age adults are unemployed. In April 2011, the Haida Gwaii Management Council—made up of two representatives appointed by the provincial government, two representatives appointed by the Haida Nation, and a neutral chair—was granted the responsibility for setting the islands’ timber quota (rather than the chief forester of the province) and responsibility for conserving the islands’ heritage sites. Write to the following Canadian officials to state your support for a true consultative relationship between provincial and federal government and the Haida Nation. Purchase products made from sustainably harvested wood; look for certification by the Forest Stewardship Council. Cayo, Don. “Forest Renewal Plan Could Yield Big Bucks for Haida.” The Vancouver Sun, January 13, 2007. Council of the Haida Nation. Council of the Haida Nation. Council of the Haida Nation. “Islands Spirit Rising.” Council of the Haida Nation. Council of the Haida Nation and the Province of British Columbia. “Haida Gwaii Strategic Land Use Agreement.” News release, September 13, 2007. Fenwick, Fred R. “Aboriginal Law: Haida Nation v. British Columbia (Minister of Forests): Supreme Court Confirms Duty to Consult With Aboriginal Peoples.” Law Now, April 1, 2005. Haida Land Use Vision (2005) pdf document. Lukovich, Jeff. “Place of Wonder: Longhouse Remains, Sacred Sites Recall the Glory of the Haida Who Ruled These Shores.” The Vancouver Sun, September 17, 2005. McCullough, Michael. “Haida, Supporters Blockade to Demand Sustainable Forestry: Sale of Weyerhaeuser’s B.C. Assets, Including Timber Rights in Charlottes, Trigger Protest.” The Vancouver Sun, April 4, 2005. McCullough, Michael. “Wait and See Attitude Prevails as Haida Blockade Continues: Millions of Dollars of Timber Seized by Protesters.” Victoria Times Colonist, April 2, 2005. McKinley, Judy. “Land use agreement marks beginning of a new relationship.” Queen Charlotte Islands Observer, January 18, 2008. Parks Canada. Gwaii Haanas National Park Reserve. Parks Canada. SGang Gwaay World Heritage Site. Ramsay, Heather. “Haida, Victoria Reach Agreement on Land Use: Deal to End Weeks of Logging Blockades on the Queen Charlottes Protects Prized Cultural Areas.” The Vancouver Sun, April 23, 2005. Takeda, Louise. “Haida Action Holds Hope for a Better Future.” Victoria Times Colonist, April 6, 2005. United Nations Educational, Scientific and Cultural Organziation. “SGang Gwaay.”UNESCO World Heritage Center. Williams-Davidson, Terri-Lynn. “Sacred Objects, Art and Nature in a Global Economy.” In Paradigm Wars, edited by Jerry Mander and Victoria Tauli-Corpuz. San Francisco: Sierra Club Books, 2006.